goku SSJ3 vs Majin Buu. goku in his super saiyan 3 form fights against the horrid Majin Buu!. Wallpaper and background images in the dragon ball z club tagged: dragon ball z goku ssj3 majin buu. 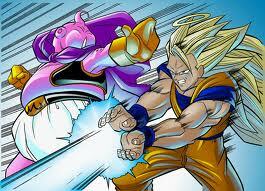 goku in his super saiyan 3 form fights against the horrid Majin Buu!